I am still in holiday mode, also a bit tired (tired from a HOLIDAY, shame on me!!! ), so I am not doing any research or reading any of the interesting material sent to me by some of you (thanks!). I will in the next few days or so. In the meantime, here is another petit anecdote. We spent the last three days of our holiday in a glorious bed and breakfast, a lovely 18th century country house with scenic views of the Provençal countryside, just 10 km. from Avignon. Our room was huge, the bed was comfortable, and the views from our bedroom terrace were splendid. Breakfast was served on a large ancient stone-paved terrace shaded by grapevines. Again, lovely views all around. 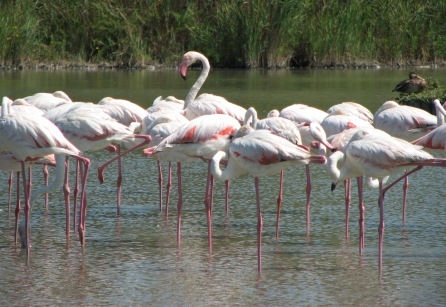 We planned to tour the Parc Ornithologique of Camargue on Tuesday, the day after we arrived in the Avignon area. 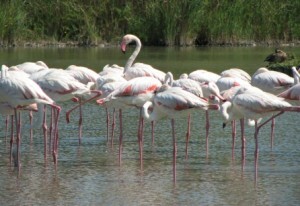 We were eager to see pink flamingos and some of the 100 other bird species that nest there during the summer (for more photos, click on Les Oiseaux: http://www.parcornithologique.com/). I must say, this was definitely a highlight of our entire trip, and I recommend that devoted bird watchers pay a visit to this park if they get the chance. If you go in August, though, let me warn you that parts of the trail around the park are completely unshaded, so come prepared (bring hats and water, mainly). Hot!!! At any rate, early on Tuesday morning, waiting for Stefano to get out of the shower so we could go downstairs for breakfast, I was sitting on our bedroom terrace, enjoying the views, the peace and calm, and the sight of chirpy little birds fluttering hither and thither. Suddenly I heard an incredibly loud clacking/croaking noise…and a few seconds later a huge bird, with the biggest wings and the longest legs I had ever seen in my life, landed on top of a tall pine tree down in the field. Right in front of me. Stunned, I was unable to move for a moment (this incident occurred before I’d had some coffee, so reflexes were on the slow side…). Unfortunately, by the time I had grabbed my camera, the bird was gone. I got a miserable shot of its big wings flapping in the distance. Not worth posting. Hopping up and down with excitement, I breathlessly declared to a dripping wet Stefano: I just saw a pink flamingo! A pink flamingo? Well, he wanted to believe me, but I could tell he was sceptical. Off we went to have breakfast. 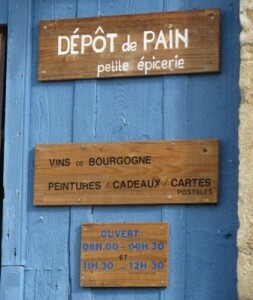 In my half-invented but apparently comprehensible French, I described to our hostess what I had seen. Grinning good-naturedly, she informed me that I had actually seen a heron that visited their fish pond at the same time every morning. She went on to reassure me that I would have another chance to take a photo of it. But the heron must have found other early morning feeding grounds in the following two days, since I didn’t see it again. Mixing up pink flamingos and herons. I suppose that means that my career as a bird watching expert is over…even before it started! O h, this part of the trip was so much fun. 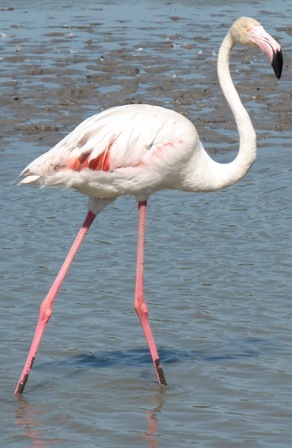 It is very entertaining to watch feeding flamingos (see photos 2 and 3; in 2 you can also see a couple of irritated males confronting each other). They dip their heads into the muddy water, then (almost as a group, it seemed to me) raise them, making rather dreadful honking noises and waving them about in the air. Then their heads, upside down so that their beaks can filter micro-organisms out of the water and mud, go back down into the water…again, almost simultaneously. Up, down, up…very odd to watch. But some of the best shots I got were of sleeping flamingos. They really do sleep perched on one leg, with the other leg folded up under their bodies and their heads laid over their backs, as you can see in the last two photos. 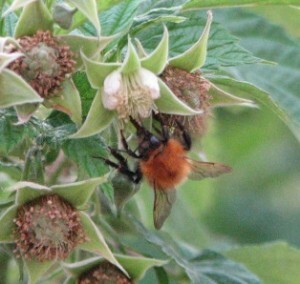 -Their eyes are bigger than their brains (fancy that…!). 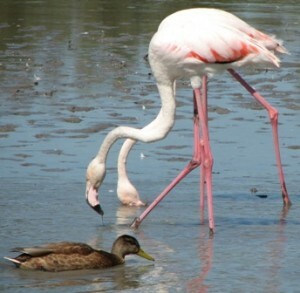 -Their pink colouring is due to the carotene found in their food—algae and small crustaceans. 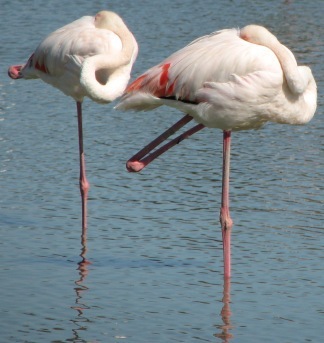 Without carotene, their feathers would be white. 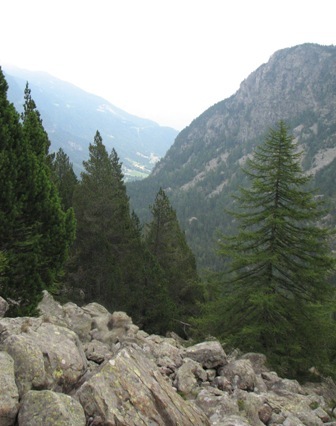 Trekking in the Alps…what was I thinking? I am going to jump back to the beginning of our holiday, to the part when we were still in Italy, more precisely in the Alpine region of Valle d’Aosta, a five-hour drive north-west of Florence. Our hotel was located on the edge of the Mont Avic Natural Park, the first natural park in Valle d’Aosta (for more info, see: http://www.montavic.it/). Our room had a terrace with marvellous views of the Alps. In fact, I would have been quite happy just to sit out there all day, enjoying the chilly breeze and stunning views, but no, we had brought our trekking gear with us, so off we went on a long hike in spite of the uncertain weather (as you can see from my rather hazy photo). This particular hike is recommended for “beginners” by the Mont Avic tourist info office. The trail led to a lake called Lac de Servaz, at an altitude of 1806 metres. The hike didn’t sound too bad, a little more than five kilometres roundtrip, an estimated two/two hours and a half each way. We figured, hah, no problem, we can manage that. 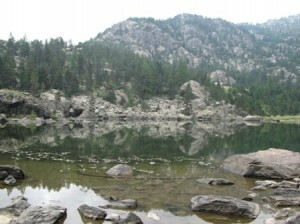 Ah, but we hadn’t calculated that most of the way to the lake was a steep climb up a rocky and rather jagged mountain. We ended up climbing a bit more than 500 metres. I must remember to thank Sherlock for giving us trekking poles. Without my poles, I probably wouldn’t have made it. As it is, after about two hours (plus some) of climbing and sweating buckets in spite of the cool breezes, I felt that I just couldn’t climb any farther. I decided to tell Stefano to keep going up to the lake that I was beginning to believe didn’t exist, and that I would wait right there for him to return. But I decided to go around one last vertical bend. And there it was. The lake. A haven of peace and quiet. We sank down on its welcoming rocky/grassy beach, ate our sandwiches and rested for 15 minutes or so. If it hadn’t been rather cloudy, my photos would have been amazing. But clouds obscured the view of the mountain peaks above us. Oh well, can’t have everything! In the end, we were happy that we had made the climb. The views were spectacular, and besides, the entire trek hadn’t taken us more than five hours, so we felt that we had done quite well for two city folks with a rather sedentary lifestyle. We are home. After driving more than seven hours from Avignon to Florence yesterday, we are a bit tired and taking it easy today. Hmmm, in spite of having unsubscribed to all of my daily e-newsletters, during my absence I received almost 200 e-mails (GULP!). How did that happen??? Well, it is going to take me a while to sort through everything, so if you are eager to hear from me, please send me a new message, and I will do my best to answer ASAP. Thanks! I have decided to write my holiday stories without following any particular chronological order. If a photo reminds me of an amusing episode, then that is what I will write about, so please be prepared for a bit of jumping back and forth between Burgundy, Lyon and Provence. Ah, I should mention that I took almost 2,000 photos…but I promise I won’t publish all of them (hehe)! I took the above photo of a Charolais cow and her calves in a field near the self-catering cottage, or gîte, where we spent the first ten days of our holiday in Burgundy. 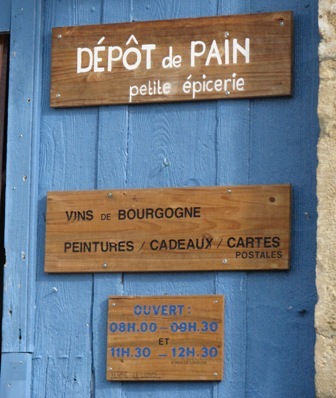 Our cottage was located in a quaint little village called La Motte-Ternant, whose only store, a minuscule but well-stocked dépôt de pain, was open from 8:00 to 9:30 a.m. and from 10:30 to 11:30 a.m. (the sign can be enlarged by clicking on it, by the way). Rather odd store hours, eh. We soon came to rely on the dépôt‘s manager, a very cheerful and simpatico Dutchman who also runs the local campground and is full of great advice on things to do, places to go and so on. His weather forecasts really helped us plan our day trips. Merci, Robert! But let me get back to the cows for a second. Last Saturday (August 23rd), as we were leaving La Motte-Ternant on our way to Lyon, the second “leg” of our journey, we were stopped by an elderly man waving his cane in the middle of a deserted country road. I rolled down my window, and he explained (in very fast French, mamma mia!) that his family was moving their herd of cows from one pasture to another, so we simply had to wait or else…! 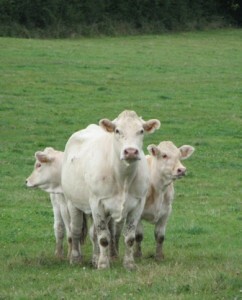 With no herd in sight and not the slightest noise to be heard, we were a bit puzzled, I confess. But we had no choice. As we waited for the herd to materialize, I had a little friendly chat with our charming monsieur. And sure enough, as promised, about five minutes later a small herd appeared around the bend. As you can see from the photo I took (one of many), the cows thundered (okay, ambled) straight toward us before being led into a pasture on the left side of the road about a metre or so from our car. 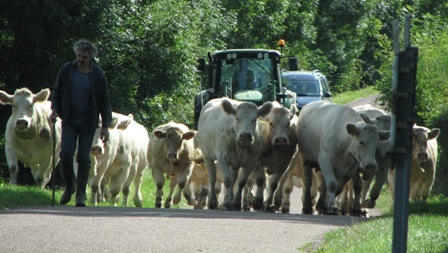 If monsieur hadn’t stopped us, I hate to think how the car would have fared…! We thanked him and sped off toward Lyon. I am at an Internet café in Saulieu, Bourgogne, typing on a very slow old Mac that has a French keyboard (! ), so this will be très BRIEF! Bourgogne is lovely, we have been travelling all over the place and enjoying the pure air and the food (the cheese, mamma mia). Too bad I cannot upload any photos. Ok, I have had enough fun with this bloody keyboard…and Flavigny sur Ozerain (where “Chocolat” was filmed) awaits us, so off we go! Hope everyone is okay. Take care, à bientot! Another article (http://tinyurl.com/6n252w) informs us about a study on food compounds that kill acute lymphoblastic leukaemia, or ALL, cells. Of course, curcumin is among them. But also carnosol from rosemary. Okay, I have to go now. We are getting ready to leave. Valle d’Aosta, here we come. Well, we haven’t packed yet (PANIC ATTACK!!! ), but tomorrow morning we are driving to Valle d’Aosta’s Mont Avic Regional Park. It’s located at 1300 meters, so it should be COOL up there (yippee!). On Tuesday we are heading to the Morvan National Park in Burgundy where we will spend ten days hiking and visiting the area (Dijon and so forth). We will then slowly find our way back to Italy via Lyon, then Avignon, the Camargue Regional Park and the Aix-en-Provence region of gorgeous lavender fields and lovely medieval hilltop villages (ah, yes, it’s a tough life! ). We will be back in Florence between the 28th and the 30th. I see that I am going to have a lot of practice speaking French. Yesterday and today I called several B&Bs whose owners did not speak any English or Italian. Another PANIC ATTACK! But I managed to make reservations in my rusty French (more like French-sounding Italian, probably! ), so I am pleased. Very pleased. Being able to communicate is what really matters, I always tell my students. Who needs perfection? Anyway, this is just a quick post to give all of you my best wishes for good health and a wonderful next couple of weeks. Oh, and I really apologize if I haven’t been too consistent at answering your comments and e-mails, sorry about that. I’ve been as busy as this furry little bee on my raspberry bush (I have seen many more bees in my back yard this summer, which really makes me happy). If we come across an Internet café in France, I will try to post something, a few words at least!, on my blog during this period…I will try! Sherlock, fa’ buon viaggio e torna prestooo! She then hangs upside-down from the ceiling. Have a great (rest of the) summer, everyone! Sherlock (grazieeeee!) sent me a study titled “Dietary flavonoids inhibit the anti-cancer effects of the proteasome inhibitor Bortezomib” (see abstract: http://tinyurl.com/5pdxtu), published in the July 16 2008 issue of “Blood.” This is an important study for those who are taking Velcade (Bortezomib) and supplements at the same time, so I decided to read, and post about, the full study. It’s quite a long post, sorry about that! Quercetin is the most mentioned compound in this study. As you can read on my Quercetin Page, quercetin is a plant chemical, specifically a flavonol, found in apples and red onions and a variety of other foods such as capers, broccoli and red grapes. In the abstract we can read that quercetin inhibited the killing effect of Bortezomib on primary CLL and malignant B-cell lines. Interestingly, though, when inorganic boric acid (a low toxic substance derived from boron, an element found in rocks, soil and water) was added to the quercetin-Bortezomib combination, this inhibitory effect was diminished. Let me highlight that the cell lines under scrutiny were CLL (=chronic lymphocytic leukaemia) and other malignant B-cell ones. And what about myeloma cell lines? Well, the researchers found that quercetin had a direct effect on myeloma cells, which sounds like very good news. Indeed, the researchers write, At high doses, quercetin itself induced tumor cell death. Death to myeloma cells? Yippeedadoodee! (Except that I recall reading that we should not take high doses of quercetin, I don’t remember why right at the moment, but I have never taken more than 1.5 grams/day of this supplement, so please be cautious…). Let’s go on to the full study now. I might as well fess up right at the beginning that I didn’t understand all of it. So I will concentrate on the bits that I did understand. An interesting titbit is that Bortezomib kills CLL cells in vitro but does not display substantial anti-tumor activity in patients with CLL. So Bortezomib has anti-cancer activity in a lab setting but not when administered to CLL patients. Just goes to show that sometimes, unfortunately, in vitro anti-cancer activity cannot necessarily be reproduced in vivo. The researchers then tell us that Quercetin is one of the most abundant flavonoids in the human diet and is a potent anti-oxidant. In fact, and this is something I did not know, quercetin is the chief dietary flavonol present in the blood. It is also a proteasome inhibitor, as is Bortezomib. Let’s get to some results. As the abstract anticipated, there is definitely interference between quercetin and Bortezomib as far as CLL cells and other malignant B-cell lines are concerned. Not a good thing, clearly. Two specific myeloma cell lines were also tested. In order to fight the killing activity of Bortezomib, however, these cells had to be treated with a very high dose of quercetin: Quercetin also had the same inhibitory effect on Bortezomib-induced apoptosis in two myeloma cell lines, U266 and RPMI-8226. However, the myeloma cell lines required higher levels of quercetin (40 micro-M) for maximal inhibition of Bortezomib-induced apoptosis, as compared to 20 micro-M for primary CLL, HRC57 and DoHH2 cells. Then we read that In addition, myeloma cell lines were more susceptible to quercetin-mediated G2/M arrest compared with the B-lymphoma cell lines. So, in sum, when myeloma cells are “pre-incubated” with a not-too-high-dose of quercetin, their sensitivity to Bortezomib increases, which is a good thing. And another thing: myeloma cells can apparently be killed outright by quercetin, if I understood this part correctly. Of course, in vitro effects may not be the same in vivo, as we know. Proceed with caution, as always. At any rate, further on we can read a possible explanation for this peculiar occurrence. When quercetin and Bortezomib were added at the same time, the former had an inhibitory effect on the latter. But when myeloma cells were pre-incubated with quercetin, the inhibitory effect was less evident: However, in both myeloma cells lines, pre-incubation with quercetin led to less inhibition on Bortezomib-induced killing, suggesting that myeloma cells are more active in their uptake and utilization of quercetin, thereby reducing the chemical binding between quercetin and Bortezomib. So myeloma cells, unlike CLL cells, gobble up quercetin, which is how the chemical bonding between the two substances can be avoided. Interesting. The researchers tested other dietary flavonoids, such as myricetin (found in grapes, berries, fruit, veggies, herbs and walnuts), apigenin (in parsley and celery) and kaempferol (in broccoli, tea and grapefruit) , which, like quercetin, are antioxidant compounds possessing anti-proteasome activity. Of these, only myricetin had an inhibitory effect on Bortezomib. Interestingly, its chemical structure is similar to that of quercetin. Makes sense. The researchers conclude that there are many dietary flavonoids which have similar structures with quercetin or myricetin, so the intake of dietary flavonoids may reduce the killing activity of Bortezomib on circulating leukemic cells. Other findings: EGCG has an inhibitory effect on Bortezomib, so I probably wouldn’t drink any green tea if I were taking Velcade. I also wouldn’t drink any Cabernet Sauvignon or eat cranberries or Concord grapes, which contain a compound called delphinidin that also inhibits Bortezomib. As does cyanidin, found in many types of berries including grapes, blackberries, blueberries, cranberries, raspberries and cherries; and also in apples and plums. But there is some GOOD NEWS: curcumin and resveratrol were also tested and found to be okay when taken together with Bortezomib, which confirms what I had read in other studies. In the Discussion part I found another interesting titbit that is a bit on the technical side (sorry about that! )…here is the full quote: Quercetin and Bortezomib share similarities with respect to proteasome inhibition and the induction of apoptosis. They both can be used in the treatment of cancer. However, the differences between these two compounds are (1) Bortezomib is a boronic dipeptide acid and quercetin is a flavonoid; (2) Bortezomib is a ROS-inducing agent and quercetin is an anti-oxidant. The question is whether they are synergistic or counteract each other in combination. We observed that quercetin prevented Bortezomib-induced ROS generation and apoptosis in primary CLL cells. However, quercetin also blocked Bortezomib-induced apoptosis in B-cell lines in which ROS generation was not evoked. I repeat, this inhibitory effect of quercetin on Bortezomib is true for CLL and other malignant B-cells. Not for myeloma cells. Further on, we read that, while Bortezomib does not seem to work well for CLL patients, it is highly active in myeloma, another B-lymphoid malignancy, suggesting differential sensitivity to Bortezomib according to tumor type. Also, and this sort of repeats what I have written earlier, myeloma cells pre-incubated with quercetin were not as protected as CLL cells from the apoptotic effect of Bortezomib. The researchers suggest that quercetin (at 20 micro-M) has a direct effect on myeloma cells, but not CLL, HRC57 or DoHH2 cells, to increase sensitivity to, and/or synergize with, Bortezomib. The researchers add that it is not known if dietary quercetin (i.e., not in supplement form) would interfere with Bortezomib. So CLL patients don’t necessarily have to stop eating apples and onions (the easiest thing to do is ask your doctor). And they also remind us that Not all dietary flavonoids can inhibit Bortezomib. Myricetin showed a similar effect to quercetin on the inhibition of Bortezomib, but kaempferol and apigenin did not. The study ends as follows: The differential in vivo activity of Bortezomib seen in myeloma and CLL may partly be attributable to the effect of dietary flavonoids: quercetin primes myeloma cells, but not CLL cells, such that they become more sensitive to Bortezomib-induced killing. Further work will elucidate the in vivo significance of these findings, which in turn will inform the need for dietary advice on the intake of flavonoids, as well as drug manipulation of flavonoid activity. Hmmm, just as I had written a few concluding sentences and was about to publish this post on my blog, I did a quick online search just for the heck of it and came across a pertinent June 2008 “Haematologica” report (http://tinyurl.com/6hzqjg) whose findings made me add the following paragraph. A group of Korean researchers tested six polyphenols—rutin, quercetin, caffeic acid, gallic acid, EGCG, and tannic acid—discovering that they all inhibited the anti-cancer activity of Bortezomib. Well, we already knew about quercetin and EGCG, so that is nothing new. Now, the following is mere speculation on my part, but I have the feeling, based on what I understood from the July “Blood” study, that these compounds may have been added to the myeloma cell lines at the same time as Bortezomib, and that might explain the interference. My point: the Korean study results might have been different if these substances had been added an hour or so before Bortezomib, which would have given the myeloma cells enough time to gobble them up, thus diminishing the interference potential. Pre-incubation with these polyphenols, in other words, might have made the myeloma cells more sensitive to the killing effect of Bortezomib, which would agree with the “Blood” study results. Again, since I have not seen the full Korean report, this is pure speculation on my part. After reading this abstract, though, I would be concerned if I were taking Velcade and any of the above-mentioned and possibly interfering compounds (not curcumin or resveratrol, I repeat). So, here is my advice to Velcade-takers: please consult your doctor before adding anything to your protocol. Best to be on the safe side. Well, in the pre-curcumin era I had always successfully treated these bloated objects with my family doctor’s simple home remedy, so I knew what to do. I wrapped my finger in an alcohol-soaked bit of cotton and waited. But the remedy didn’t work this time…I must have caught a resistant sort of super-germ. My finger continued to hurt and swell. So I went on Internet, painstakingly using my left hand (I am right-handed, so manoeuvring my mouse with my left hand took quite a bit of patience…), and found an Italian “grandmother’s remedies” website. The remedy for giradito that made the most sense to me was to dip the injured finger in boiling, salted water. Just like pasta. So that’s what I did. OUCH! The only result was that the germs inside my finger angrily gnashed their little teeth and increased the pain in my finger (actually, I think this remedy does work, but perhaps the water doesn’t need to be so bloody hot…!). My whole hand began to throb at that point, and my formerly-normal thumb also started to hurt and turn red. Not a good sign. When Stefano got home from work, we even considered going to Careggi hospital’s emergency room, but it’s August (most of Italy is on holiday) and it was late at night by then, so we quickly nixed that idea. Stefano looked through the medicine cabinet and found an antibiotic that I had taken last September for my bronchitis. Bronchitis, not giradito. But the directions said that it would work also against generic “bacterial infections.” Good enough. I took a pill. I then smeared my finger with Polysporin, an antibiotic ointment, Stefano bandaged it loosely but carefully, and we went to sleep. This morning my finger was much less swollen and less red. It still feels a bit like an alien appendage, but the pain is gone. Yeah! By the way, just as a precaution, this morning I called my doctor, who interrupted me halfway through my story with the statement: “you need to take an antibiotic.” He was pleased to hear that I had gone ahead and done just that. I mention this because I think it’s a good idea to get in touch with your doctor when things like this happen—infections are no laughing matter! At any rate, it would seem that I had been attacked by a super-germ. And the only thing that I had touched until that first stab of pain had been the shopping cart. And here we get to the main reason I wrote this post, that is, to warn you to be more careful than I was. Germs are everywhere, and particularly those of us with compromised immune systems must be a tad more cautious than others. Under certain circumstances, perhaps it is not a bad idea to wear disposable gloves (perhaps brought from home!). We shouldn’t go overboard, of course. Not all germs are harmful, so, when you go shopping, chances are that all you will need to do is keep your hands away from your face and then wash them carefully with soap and warm water when you get home. This reminded me of a show on germs that I watched years ago on U.S. television. All sorts of objects, including supermarket carts, were swabbed and analyzed. A scary finding was that flesh-eating bacteria were found on shopping cart handles. Makes you think, eh? And have a look at this 2006 ABC news report: http://tinyurl.com/56ntdq 1,100 germ colonies? Yikes! And if you thought that your office desk was safe, read this: http://tinyurl.com/6httab Mamma mia! But, as I said, there are good germs and bad germs. A blog reader (thank you!!!) sent me a bunch of interesting links, among which was one (see: http://tinyurl.com/5dc2us) about a marine-derived anti-tumour compound that annihilates myeloma cells in vitro and is extracted from a tunicate called Aplidium albicans. According to Wikipedia, tunicates are underwater saclike filter feeders…weird-looking creatures that eat by filtering sea water through two openings in their bodies (“in” and “out” openings, sort of). They feed mainly on plankton. Not the prettiest creatures I have ever set my eyes on, that is for sure…ah, by the way, they are more familiarly known as sea squirts. At any rate, this particular tunicate has squirt…I mean, yielded a substance called aplidin (drug name: plitidepsin) that is now being tested in Phase II clinical trials on relapsed or refractory myeloma patients, see: http://tinyurl.com/6rzumj. An interesting thing about this compound is that it has a powerful in vitro activity against myeloma cells that have become resistant to conventional anti-myeloma drugs such as dexamethasone, thalidomide and bortezomib, according to the above-mentioned July 2008 study. A June 2008 study (see: http://tinyurl.com/6k8l3w) tells us that treatment with aplidin was well tolerated by myelomic mice (sigh) whose serum paraprotein concentration was reduced by 42% and BM invasion with myeloma cells was decreased by 35%. Angiogenesis was also reduced to basal values. Not bad, eh! Well, these two studies have been published only recently, and the clinical trial is ongoing, so we will have to be patient and wait to see what happens. Unfortunately, Sherlock wasn’t able to access the two corresponding journals, so I cannot even take a peek at the full studies. Oh well. However, according to the first abstract I cited (the July 2008 one co-authored by Dr. Ken Anderson), the preliminary trial results appear to be favourable. Just as I was about to publish this post, I came across another interesting titbit, a review of aplidin on the IMF website (http://tinyurl.com/5dfplb), where you can watch a video presentation on aplidin by Dr. Enrique Ocio, University of Salamanca, Spain. Here we can also read that 31 relapsed/refractory patients were enrolled in the trial, median age 65: Out of the 26 evaluable patients, 2 (8%) achieved PR and 3 (12%) MR. Eight patients (31%) remained in stable disease (SD). The conclusion was: Aplidin is effective both as a single agent and in combination with dexamethasone in the in vitro and in vivo settings. Its activity in relapsed/refractory MM patients is promising with an acceptable toxicity profile. There is quite a bit of interesting information on this page, so please have a look. I have to prepare my classes for tomorrow, so I must stop here. Have a great evening, everyone! Beth posted (see: http://tinyurl.com/5bg9wh) about a July 31st Science Daily article that I hadn’t read yet …Science Daily newsletters tend to pile up in my e-mail box, and I read them only when I have a snippet of extra time, which does not happen very frequently (especially of late!). Anyway, this particular article talks about the recent discovery of two processes that lead to the development of myeloma and other types of B cell malignancies. Fascinating stuff…I hope to be able to read the full study this fall. In the meantime, here are a few excerpts from the SD article (you can read the full text here: http://tinyurl.com/66kp3u). Now, I had read about TRAF (=”TNF receptor associated factor”), but this is the first time, I think!, that I have seen any mention of this NIK thingie (NIK stands for “NF-kappaB inducing kinase,” by the way). Just goes to show how much there is to learn…! Anyway, this is what happens: The first process involves NIK, an enzyme that acts closely with BAFF, the substance that regulates the number of B cells in our bodies. If we have too much of this enzyme, NIK, in our body, then we may develop a B cell malignancy. Lovely. So, under normal circumstances, the two molecules work together. But, at a certain point in time, one of them may go bonkers for some unknown reason and escape the other’s control. And this unfortunate event could lead to the development of a B cell malignancy. I am left with the question “why does this happen?” that may find an answer in the full study. This discovery won’t mean much for us patients right now. But in the future perhaps we will be able to be tested for these mutations and take what the article defines as targeted medications. That would be good, so long as said medications are natural and non-toxic. Speaking of non-toxic, and just for the fun of it, I just googled curcumin and NIK. Well, well. I came across something of interest that I hope to look into more carefully in the next few days: curcumin inhibits the deranged NIK oncogene…see http://tinyurl.com/6exze6 and http://tinyurl.com/64vxsl. How about that? Oh, coincidentally, I see it’s time for me to take my daily dose of the phenomenal yellow powder! Off I go!